Here’s a secret: Two threads are better than one. To measure a warp, I always, without exception, wind the warp with two or more threads together. A warp that is wound with a single thread is prone to tangle as threads twist around each other. A warp wound with pairs of threads won’t do that. Choke ties secure the warp bout around the starting pin on the warping reel. I hold two threads in my right hand, with my little finger separating them, to wind the warp. My left hand turns the warping reel. I purchase enough thread to be able to wind with two tubes at a time. Any thread that remains unused goes toward another project. I am particular about this warp. It’s linen, so consistency matters. Tangles would disrupt the even tension the linen needs. I have dräll in five-shaft satin in mind as I take each careful step to dress the loom. I expanded the loom to ten shafts to be able to weave this! Expect happy weaving, to be sure, but imagine how pleasant it will be to hold this dreamed-of cloth in my hand. That future cloth gives meaning to my present efforts at the loom. Various stages of weaving. Winding 16/2 unbleached line linen to warp the Standard loom. The Baby Loom (Glimåkra Ideal) in the background is in the middle of rag-rug weaving. 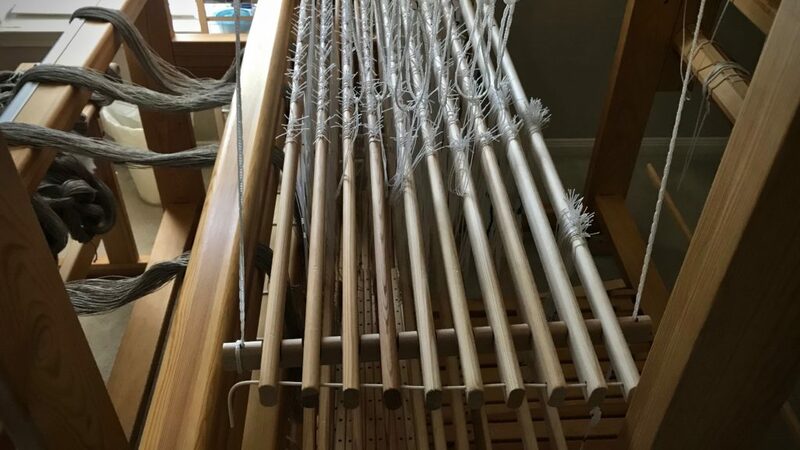 Ten shafts in place on the Big Loom (Glimåkra Standard) to prepare the loom for weaving dräll in five-shaft satin. There must be meaning beyond this life for us to find meaning in this life. The end of the weaving is the beginning of the life of the cloth. There is purposeful preparation by the Grand Weaver, with a precisely measured warp. The back-and-forth shuttle is like the ticking of a clock, or the passing of years. The end is the beginning. Can you imagine the splendid setting the Grand Weaver has in mind for his hand-woven cloth? May you keep the end in mind. Hi Cindy, Let me know how it goes when you wind with two threads. I’m curious to see what kind of difference it makes for you. So I am wondering why ten shafts with a five shaft pattern? Will you be doing a double weave? 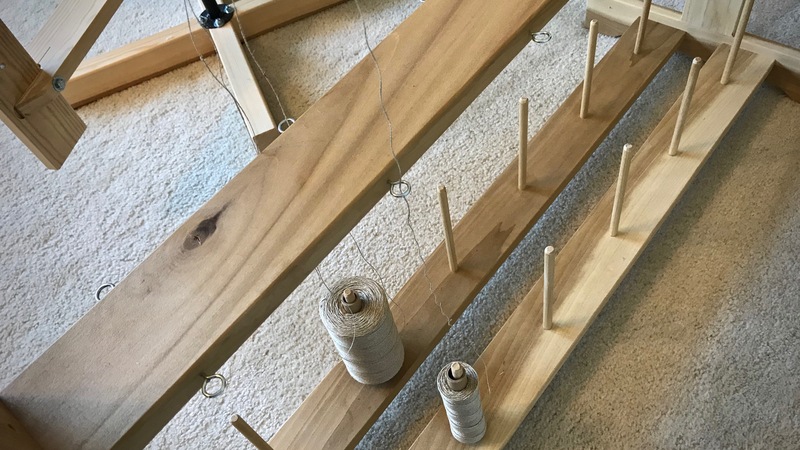 As you know, I am a Rigid Heddle weaver, however, I am fascinated by floor looms and I am toying with the idea of learning how to weave on one. I have just ordered the draft book to learn how to read patterns and have started to research the different types of floor looms. I am curious to know why you chose the two looms that you mention here. Hi Annie, You have some great questions! I can weave the satin with 5 shafts, but it would be the same all over. Ten shafts enable me to weave a pattern with two blocks. This gives the characteristic squares or rectangles in the fabric. It is still a single warp and weft, not a double weave structure. Your second question gives me an idea for another blog post – Why I weave on Swedish Looms. You can look for that in the near future. For now, I will say that I am fascinated with the simplicity, durability, and functionality of the Swedish countermarch looms. 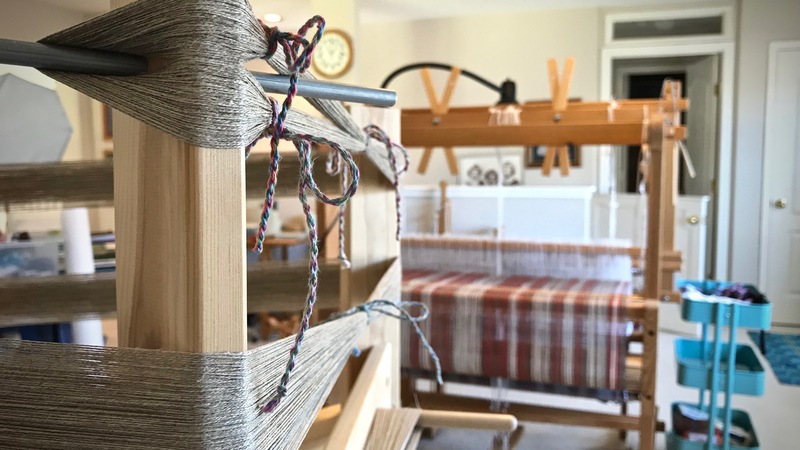 Everything about these looms work with anything I want to weave, from hearty rag rugs to fine linen lace, and make it a joy to dress the loom and weave. Thank you for sharing that information, Karen. I have a clearer picture of your project now. And a better understanding of the Glimakra loom. Your blog is very inspirational! Thank you. Hi Linda, It warms my heart to hear that the words I write touch a chord with you. Karen, it’s always a treat to stop by your blog. Your learning and experience have helped me a lot in the past even though I don’t comment a lot. This is a peaceful and relaxing place with lots of beautiful things and a great hostess! Thanks for just being here and passing on your knowledge and experience. I love the 2 thread cross and do it whenever I can. I adopted it a while back. 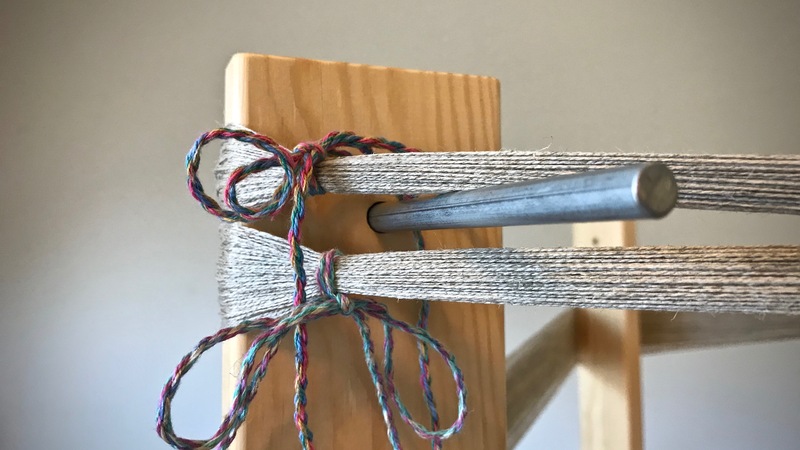 I’ve found it’s a lot easier at the lease, to beam on with a 2 thread cross – less tangles and for me it seems easier to pick from for threading. I’ve even done a 4 thread and has no problems. You make a great point. A 2 thread cross does indeed seem easier to pick from for threading. I have also done 4 threads with no difficulties. And thank you for your superb conclusion. It helps to stand shoulder-to-shoulder when we face life’s challenges. We weren’t meant to go it alone!